Schedule a visit at the school. Many schools are very open to having the child take a tour of the school or visit their new classroom. If a visit isn’t possible, check to see if they can view some photos of the school (front door, hallways, gym, classrooms). Letting the child get a feel of the location can ease some of the anxiety. Meet the teacher. If you know who the child’s teacher will be for the upcoming year, find out if they would be willing to meet with you and your child. This could be done at the school or inviting over (or out) to lunch. If meeting face-to-face isn’t an option, you could have your child write a letter (or draw a picture) to their teacher, send an email, or maybe even Skype. Being able to start forming a relationship with the teacher can be very comforting to nervous children. Set up playdates. In situations when you know a couple of students will be in the same class (or school) as yours, welcome the classmates over or plan an outing with the children so your child will feel a special bond with a few peers. Knowing you’re not alone in a new place usually makes it easier to feel comfortable. Explore the worries. Make sure you understand what exactly they are worried about. Are they worried about separation from a parent, getting on the bus, getting lost? Figuring what the specific fear or concern is can help you both problem solve ways to cope with the anxiety. You may want to try this terrific activity from The Educator’s Spin on It, Helping Your Child with Back to School Worries. For some other fabulous ideas on preparing kids for school, check out this great calendar put together by teacher Deborah Stewart at http://www.teachpreschool.org/2011/07/september-calendar-for-preschool-parents/. Although it was created for preschoolers, many of the ideas can be applied for older children as well. Meeting or talking with the teacher/principal/staff to discuss any of your concerns … including asking what is their policy for handling a child who is upset, homesick, or ill. Hearing them say that they will certainly call you can help squelch some fears of not being right there if your child needs you. When talking about going to school, make sure you focus on the positives. Encouraging children about attending school can have a great impact … and so can dwelling on things that could possibly go wrong. Choose your words wisely; remember children hear and catch onto much more than adults realize a lot of the time. On the first day, make sure you don’t linger around. This will only make it harder on the both of you. Say goodbye with confidence that your child will have a great day … even if you have to cry by yourself in the car (very common!). Make sure you have something planned for you to do during the time your child is in school. If the time isn’t already filled, having a back-to-school coffee or lunch with other mom’s can be a great way to keep your mind occupied with people who understand what you are going through. Find appropriate ways to involve yourself in their lives and school (room parent, coach, scouting leader, etc). If this is the first year of sending this child off to school, parents can have a tough time of changing their parenting identity. Discovering new ways to be a part of their development can help you to still feel connected. 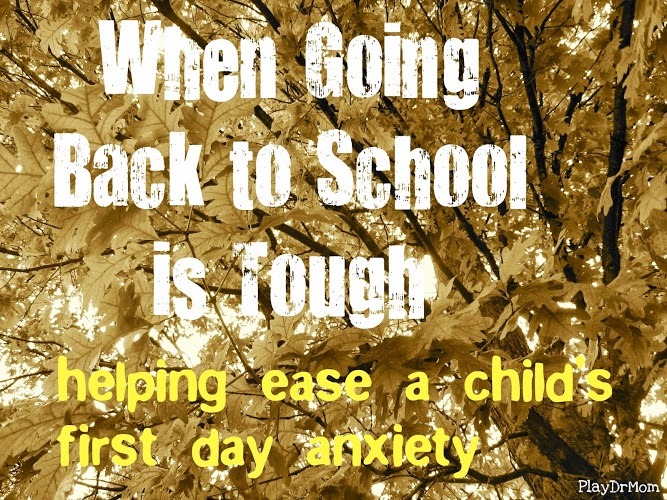 If you or your child’s anxiety about starting or returning back to school starts to get in the way of having fun, getting adequate sleep, or impacts eating habits (eating too much or not enough) you may want to seek professional help from a qualified child psychologist. They may be able to help you and your child address these concerns before they start to make a lasting impact. For MORE wonderful tips for Back to School, check out my post for the Kid Blogger Network Back-to-School blog hop linky!